Doing some activities about gym in your own home is not dreaming anymore since there are a lot of tools for doing gym are sold outside in the market. One of them are stationary bikes. The well-known product that produced these things is Schwinn. The innovation of making a good stationery bike with some series, make Schwinn often being compared to others. But, let us just compare only about Schwinn but in form of different types. This is about Schwinn AD42 and Schwinn AD46. Features of the Scwinn AD2 are 46″L x 25″W x 50″H and weighs 96lbs, maximum user weight 250lbs, 2 AA batteries to operate the display, and Tip up the end of the bike and roll it on its transport wheels to move it out of the way. Instead of those features, The abilities of Scwinn AD2 is giving you a workout with wind resistance means that the harder you pedal, the more resistance you will feel. While doing workout, you do not have to spin any dials or click any buttons, also electricity. The LCD monitor is only there to show you your speed, RPM, distance, time, and calories burned. You don’t need to use it if you don’t want to see statistics. There are handlebars to include your upper body in the workout or try to rest your feet on the pegs and work only your arms. Just like riding a bike outdoors, the act of pedaling creates a cooling breeze. You will get the sturdy frame with the feeling of a soft, contoured seat that adjusts to your height with the pull of a knob. Not only that, but also with the large and self-balancing pedals include foot straps for better control, the handlebars are foam-padded for comfort. Scwinn AD2 is simple and straightforward thing you need. 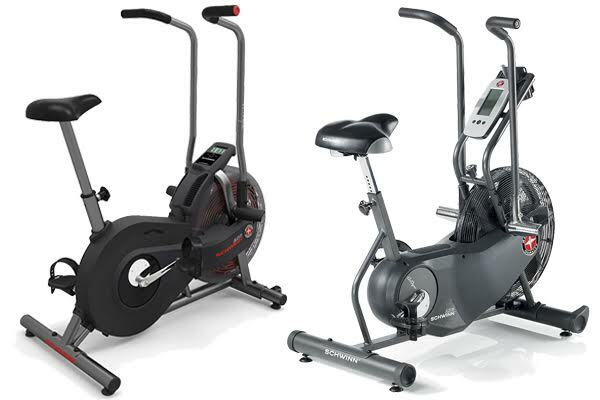 Features in Schwinn AD6 are about measures 49.7″L x 25.7″W x 50.9″H and weighs 112lbs, 2 AA batteries, and 300lbs of maximum user’s weight. The used of a fan on the Schwinn AD6 can let you increasing resistance while you will feel more comfortable because, it already improved it with quieter and virtually frictionless fan. But still hold the main purpose if you have harder pedal, your workout will become harder too. Otherwise, you can also do working out just your arms by placing your feet on the pegs below the handlebars. With user’s weight up to 300 pounds, the AD6 has a more space and weighs on the bike also longer warranty when you choose to purchase it. Other features like drive system with dual belts can improve the linkage system for better safety, and also the transport wheels are mounted at a better angle on the front for moving the bike out of the way if needed. In AD6, you can find a bottle holder, reading rack, and wind screen. The AD6 provide LCD console with an easier view of workout, advanced RPM, all to show distance, time, calories burned, and pulse rate if you have the optional heart monitor. We have a simple way to conclude about Schwinn AD2 vs Schwinn AD6. The AD2 is giving you a simple exercise bike although with the limitation of weight (250 pounds). Meanwhile, if you want a more comfortable products to do bike’s exercise with a lot of other good features like reading rack or bottle holder, and 300 pounds of weight, we definitely recommend you the AD6.